Up until I decided to finally read through the Chronicles of Narnia, I hadn't really felt much of an urge to read Prince Caspian. I mean, after The Lion, the Witch and the Wardrobe it is the most well-known of the books, but that's not saying much. Most people I knew growing up had only ever read that most famous entry of the series. But the fact that it's a direct follow-up to The Lion, the Witch and the Wardrobe did give me some hope, seeing as it was the book that I liked most thus far. Prince Caspian follows the Pevensie siblings, Peter, Susan, Edmund and Lucy, when they are summoned back into Narnia. Once they arrive, they find that it has been centuries since they ruled the land as kings and queens, and the land has been invaded by a corrupt and superstitious race of men. The boy who should be the rightful heir of this kingdom, the Prince Caspian of the title, has been deposed by his power-hungry uncle and is now fighting to take back Narnia for the talking animals and magical creatures who used to call it home. The siblings soon decide to help the would-be king defeat his uncle and put things right. While I will say that Prince Caspian does suffer from the same briefness that bothers me about the other books in the series, I am more than happy to say that it blows The Lion, the Witch and the Wardrobe out of the water. While the White Witch is a more formidable enemy than King Miraz and his court of backstabbers, the challenge seems quite a lot greater than it did in the earlier book. 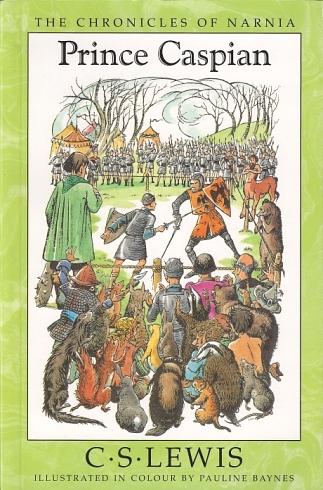 In Prince Caspian, the protagonists are working from a much weaker position: the golden era of their own rule is so far in the past that it has passed into legend, so much so that the invaders' initiative to overwrite Narnian history is successful enough that there are many, even amongst the talking animals and magical creatures, who have stopped believing that they or Aslan even existed. Considering that my main issue with The Horse and His Boy is that it came across as having some rather racist tones, I was rather pleasantly surprised that the next book of his that I read had this kind of anti-colonial stance to it. There's an implicit sort of belief regarding a kind of authority through birth-right which is a bit old-fashioned, but the erasure of culture stuff is quite fascinating really. On top of that, Prince Caspian manages to combine some solid adventure and battle scenes with some surprisingly subtle faith-based subplots. While I do question the ending a little in regards to what happens to Peter and Susan, I think that Prince Caspian is a definite improvement from the last installment that the Pevensie siblings were involved in.